The Turkish bathhouse Bey Hamam, its characteristic domes visible here, was built in 1444 by Sultan Murad II as a place for people to prepare for worship. 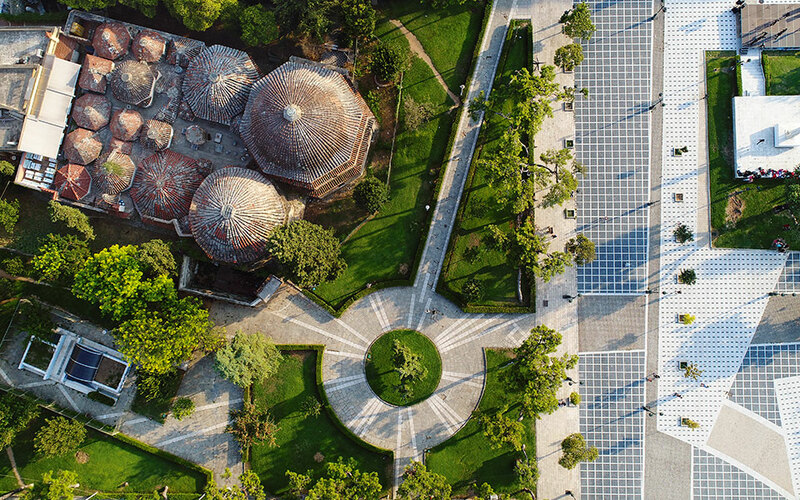 Located on the southeast corner of Dikastirion Square along busy Egnatia Street, its bath facilities are no longer open, but luckily part of the structure still operates as a café with a charming roof garden. Nearby stands a statue of Eleftherios Venizelos, the eminent Greek leader who helped liberate Thessaloniki from the Ottomans. 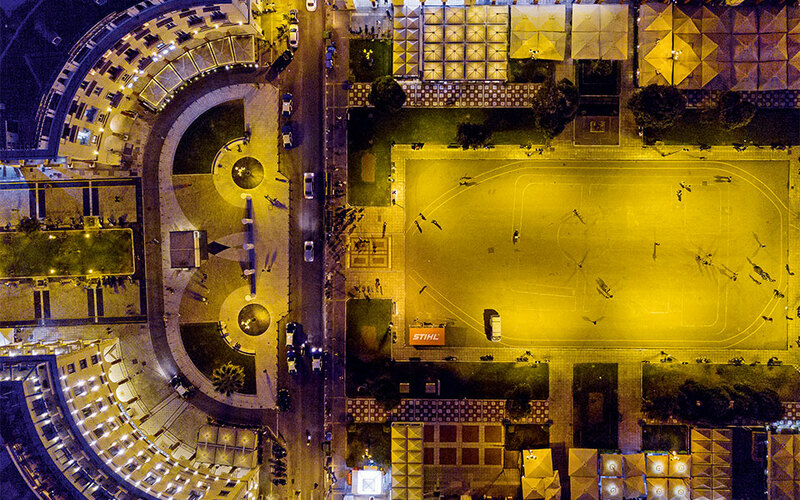 Resembling a giant pinball machine, or perhaps a wise goggly-eyed owl, when illuminated and seen from above, the square that was named for the great ancient Greek philosopher Aristotle may have fallen short of the original grandiose plans that French architect Ernest Hébrard drew up in 1918, but it’s impressive nonetheless. Hébrard had imagined it as a gateway to the sea and as a place of recreation and commerce with luxurious shops, hotels and cafés, in the image of the Piazza San Marco in Venice. Unfortunately, the sudden influx of refugees from Asia Minor in 1922 made cheaper and simpler solutions for the square necessary. In the 1930s the square’s empty lots were turned into open-air cinemas – earning it for years the nickname “The Greek Broadway” – which were gradually, from the 1950s onwards, replaced by the buildings we see today. The arched colonnades on their ground floors, together with the square’s orientation towards the sea, are part of Hébrard’s legacy and help give the square its timeless appeal. The port of Thessaloniki was established in 315/6 BC by King Cassander of Macedon. It quickly became an important naval center and continued to thrive over the centuries before finally losing its glory during Ottoman rule. Today, the port is one of the largest in the Aegean Sea, with a total annual traffic capacity of 16 million metric tons. 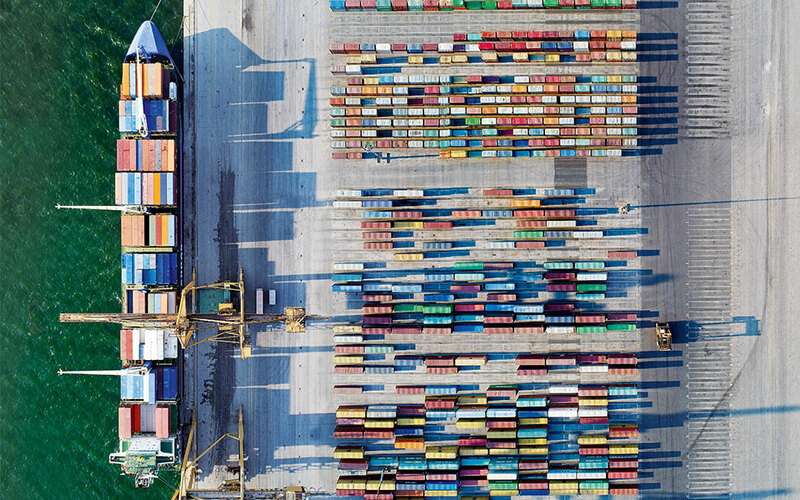 Its container terminal (pictured here) in the western part of pier 6 covers a surface area of 254,000 m2 with an on-site storage capacity of 5,000 TEUs in ground slots, making it the second-largest container port in Greece. In the first eight months of 2018, it handled 278,772 TEUs; the maximum volume ever achieved at the port was 440,000 TEUs in 2007. Plans are underway for the expansion of Pier 6 so that larger container ships can be accommodated, a project with an estimated cost of €160,000,000 that will make the port even more competitive in southeastern Europe.